You know, a silk or satin bridal robe and a pair of pretty PJs have long been the go-to choice for brides gifting their girls. We get it, too, because the comfiness is unmatched and the getting ready pics end up being perfect. All this being said, what are a robe and pjs without something equally sassy on those feet? And yes, the terry cloth or fluffy personalized “bride” and “bridesmaids” ones are cute, but they’re not exactly fashion. 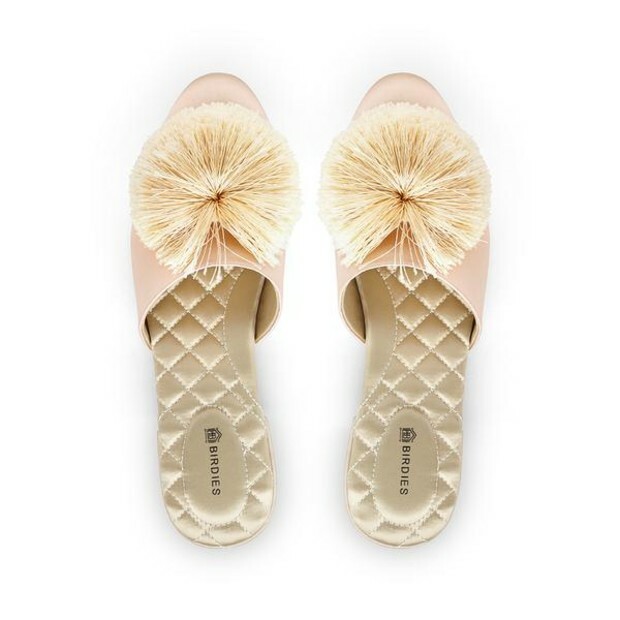 Soooo, we were ecstatic when we saw that Birdies, the company that’s completely disrupted the slipper situation with stylish slide ons that combine comfort, luxury, and versatility, had launched a GORGEOUS capsule of bridal beauties. These aren’t just novelty wears for nuptials, either, they can and will be worn long after the wedding is over. That’s a vow. To get back to that mention of them being Meghan Markle-approved, here’s the deal with that. The Duchess, who is sooo close to the birth of her first born (she should be LIVING in slippers, but doesn’t, because she’s an anomaly), has been a Birdies friendly for a long time. She’s been spotted wearing these stylish flats out and about and she even had a pair of “I Do” appropriate slippers shipped especially to her to wear on her big day last May. For all intents and purposes, Birdies - and its Co-Founder, Bianca Gates, was her fairy godmother and their stunning satin-toed, pearl-embellished bridal styles were her glass slippers. Total princess perfection. And of course, if you can design a bridal slipper to dress one of the most remarkable and refined royals that there has ever been, on her most memorable day, then obvi you should be doing it for regulars (and we mean that soooo lovingly 😉) for the days that they feel - and should feel - most like a princess. The brand new Bridal collection just debuted yesterday. 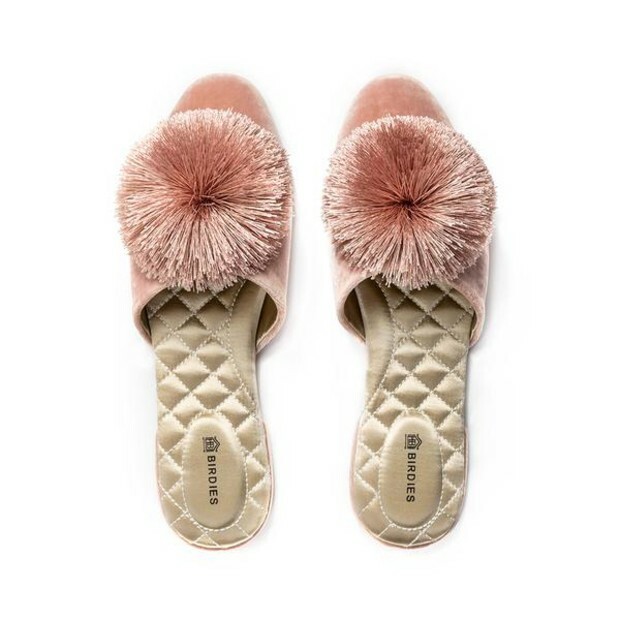 And something tells us these slippers are going to be on EVERY bride’s “must have for the wedding” rider as well as her “hold up, can we get these in bulk? ?” list for the bridesmaids. Take a peek at this 6-piece range and tell us if you aren’t obsessed by the time we’re through discussing all the decorative details and happily-ever-after haute hues. P.S. don’t stress about price, either, four pairs are being sold for $140 and the other two are priced at $95. They hit that < $150 price point pretty perfectly. And you can always reserve the pricier sets of slippers for your Maid or Honor or MOB, because they’re just a touch more important than the rest. KIDDING. 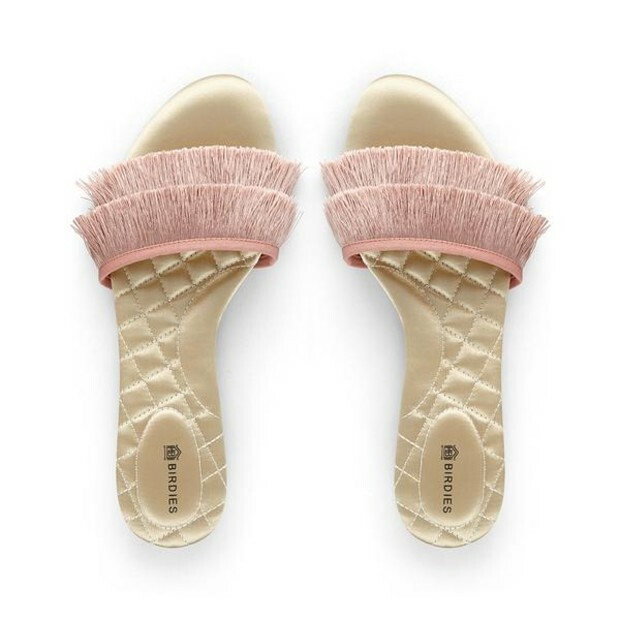 We’re loving on the Sparrow open-toed slides, in Champagne and Blush, because they’re just softer, aisle style interpretations of the jewel-toned satin-fringy Azure Sparrows in their Spring/Summer Resort collection (and these are sooooo fun, we really can’t deal). But the Songbird velvet and satin slides - fixed with either fluffy handmade pom poms or sparkly crystal embellishments - are just what we envision for elevated getting-ready ensems for the entire squad. 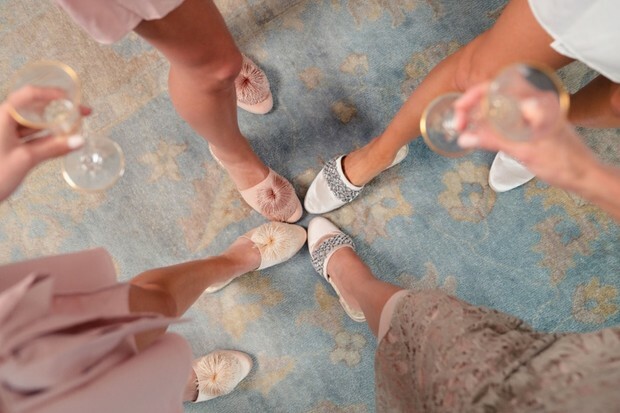 We’re already imagining the bridal suite pumping with major girl jams, mimosas and bellinis going down real smooth, cute food being snacked on, and the crew all circling up for one of those obligatory aerial feet-in photos that look 👌👌👌. Just make sure the pedi situation is on-point, because these slippers deserve an impeccable paint job…. We'll TAKE one of each, k thanks!